Chkn-N-Mo owner Bob Hemphill has been serving fried chicken in Spokane for 23 years. The Inland Northwest isn't a hotbed of soulful Southern grub. 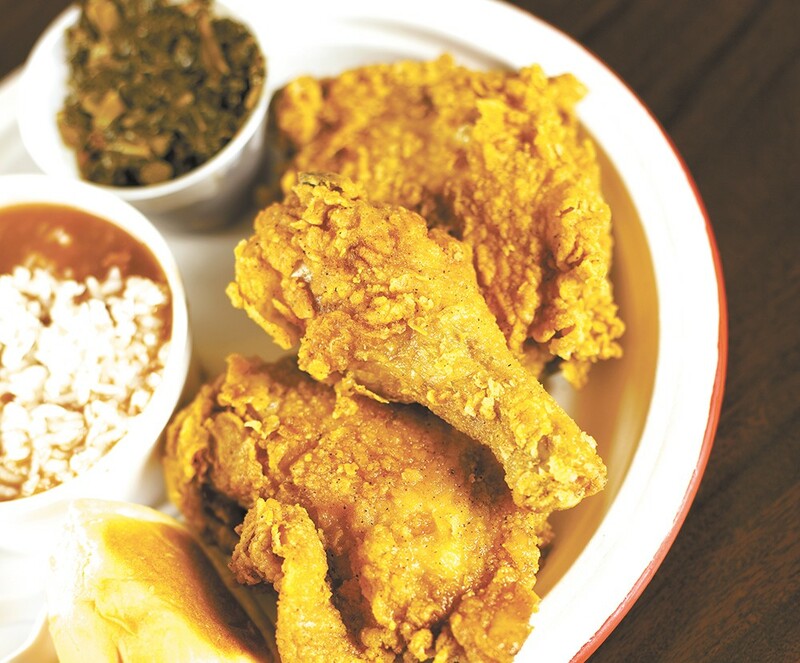 There's not exactly a place serving up hushpuppies, collard greens and spicy red beans and rice on every corner, let alone a slew of restaurants that hang their chef hats on fried chicken as their menu's focus. We have Chkn-N-Mo in downtown Spokane, of course, a place that's been serving up savory, Southern-inspired fare for 23 years, 11 in the current downtown location. And as of a couple of a couple of weeks ago, we can also claim the first Eastern Washington outlet of longtime Seattle favorite Ezell's Famous Chicken. As a Spokane newcomer, I was able to experience both for the first time within a few days of each other. It's important journalism, sure, especially as an unabashed Southern-food fiend — especially fried chicken. And ribs. Pulled pork. Oh, and catfish. Did I mention hushpuppies already? If I actually lived in the South, I'd be 900 pounds, nicknamed Wide Load and washing myself with a rag on a stick just to reach my unmentionables. But I digress. The two joints might not seem to have much in common. Chkn-N-Mo is the sole store owned by Bob Hemphill and his wife Teresa, while the new Ezell's on the South Hill is the 11th outlet of a chain started by Lewis Rudd 31 years ago, the beginning of a serious expansion of 20 to 25 more Ezell's — both corporate and franchised shops. Both Hemphill and Rudd, though, are Texas transplants — Hemphill to Spokane by choice, Rudd to Seattle by the Coast Guard — and both found themselves filling a delicious niche in their adopted cities. Rudd traveled to Spokane for the April 15 opening of Ezell's and was shocked to find that the reputation of his brand stretched to Spokane. "I was very, very surprised, pleasantly surprised, that there were so many people coming in who had the chicken before, or knew someone who had," Rudd says. If he'd checked Facebook leading up to the opening, Rudd might've realized Ezell's long-distance popularity. The page for Ezell's Famous Chicken of Spokane was buzzing with former Seattleites geeking out over the arrival of a beloved old fried friend. Rudd first learned to cook working at Brown's Fried Chicken in Marshall, Texas, and he credits that spot as the inspiration for opening the first Ezell's in Seattle's Central District. "We still have pretty much the same core menu at most of the stores," he says, but that's changing. A test kitchen at the Lynnwood store is creating new items, and sandwiches and salads will join the menu. Ezell's franchises can add their own twists to the tried-and-true; the South Hill store has buffalo wings and macaroni-and-cheese not available elsewhere. Hemphill didn't draw on any childhood inspiration for Chkn-N-Mo. "All I had was the idea," he says. "I never cooked a day before in my life." It turned out to be an inspired one for a man who previously had sold appliances at Montgomery Ward, started a cab company and owned a used-car lot. At 73, Hemphill still mans the fryers between garbage runs, catering trips and chatting with the seemingly endless stream of regulars coming in his shop. Chkn-N-Mo's fried chicken with red beans and collard greens. This is a tough matchup for Ezell's. 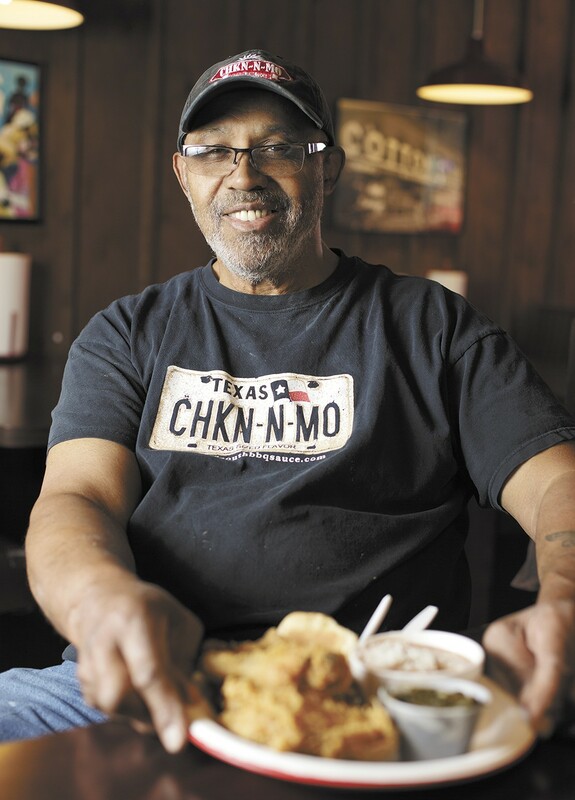 Chkn-N-Mo is full of character (and characters), including posters of historic black figures, license plates and autographed posters of local luminaries on the walls, and big bottles of hot sauce and rolls of paper towels on the tables. Ezell's is what it is: a brightly lit takeout joint in a strip mall. Which would you rather spend an hour in? I hit them during lunch rush, and had great service at both. A short wait was required, but the food came to me steaming hot with friendly smiles, even in a potentially stressful situation. This one leans to Chkn-N-Mo. Their baked beans had more spice, which I like, and their mac-n-cheese had better flavor, too. Both places also serve potato salad, cole slaw and mashed potatoes. As for items unique to each, the collard greens, gumbo and red beans and rice at Hemphill's place outdo the corn and fried okra at Ezell's.